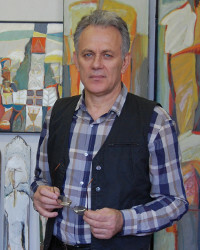 A principle that is found in the author’s artistic production is the connection between his personal history and the theme of his works. “Life bits”, events with a special emotional charge, with a “magic light”, photographic images taken in various circumstances represent starting points and they become the substance of his works. A concept that is specific to the author is that of “key images”. It is the image of a “cosmicised” reality, of metaphysics of the real. Looking at it, we realize that beyond its explicit figurative there is something else. It is the way through which the viewer with his /her imaginary can personally meet the proposed theme, something belonging to the author’s world. For Calin Beloescu image comes before technique. Or, in other words, what he has to say is more important than a particular way to say it. Having a classic training, the artist fights against the actual trends in art. Loving beauty and harmony, he feels closer to the cinema, music and dance world.